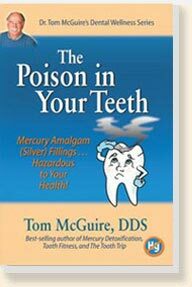 Written by Tom McGuire, DDS, one of the leading authorities on mercury amalgam (silver fillings), mercury detoxification, and chronic mercury poisoning, The Poison in Your Teeth explains why mercury amalgam (silver) fillings are hazardous to your health. Over 150 million people in the U.S. have them and they continuously release mercury vapor, the most poisonous, naturally occurring, non-radioactive substance on earth. Mercury emitted from these fillings contributes to more than 100 serious health problems, including heart and autoimmune disease, chronic fatigue, depression and memory loss. Mercury from the mother’s amalgams poisons the fetus and nursing baby and is the primary cause of autism. If you are confused, uncertain, or curious about amalgam fillings and want an objective and insightful explanation about what to do about them, The Poison in Your Teeth is the book for you. Written in plain English, with a laugh-while-you-learn approach, this wonderfully illustrated book makes learning about dental health not only painless, but entertaining. If you are serious about saving your teeth, improving your health, save money and time . . . to learn more please take the opportunity to Browse the Book. And rememberyou don’t have to take care of all of your teethonly the ones you want to keep! Please contact us for quantity orders of Healthy Teeth . For information on pricing for Special Orders call 1-800-355-7755 within the USA, or 1-707-829-7220 outside of the USA. You can also email us for information by Clicking Here. Please contact us for ordering Mercury Detoxification and Healthy Teeth - Healthy Body outside of the USA, for ordering books in quantity, or for orders that are not covered above. For information on pricing for Special Orders call 1-800-335-7755 within the USA, or 1-707-829-7220 outside of the USA. Click Here to email us for information.